Yesterday the House of Representatives rather quickly (*cough* campaign time) passed the 2015 Transportation-HUD appropriations bill. The bill, which moves to the Senate where it will likely be rolled into some kind of "emergency" fund-the-government-so-I-can-get-my-campaign-on piece of legislation, included three amendments (above) that I found interesting. The bill was filled with many other provisions. Provisions related to building things with government monies and carrying oil via rail, but unless Oppo has a large audience of commercial construction managers or railroad operators I didn't see many of those provisions being relevant. There were also provisions against using federal funds to buy Amtrak food and paying for California's high-speed rail, but because we're car people, trains are stupid. I kid, I kid - trains are great ways to move about…when you're traveling in Europe. LA, not so much. The theme of the three Republican-sponsored amendments: privacy. Congress wants to ensure that as you motor about our roads of democracy, through tunnels of freedom and across fields of grain that you are protected from unwarranted government intrusion. 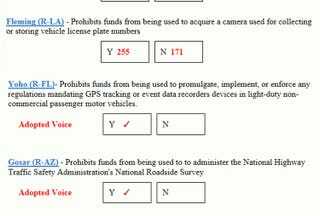 Random traffic stops that randomly target you; electronic devices that photograph license plates, your license plate; and a device that captures milliseconds of complex, dynamic vehicle information, your information; this bill will put a stop to all of this....just so long as the Senate agrees too. Sleep easier tonight car-loving America knowing that Congress is working hard to ensure you are safe from large harmful institutions, like Congress The Government and that your vehicular privacy is paramount.